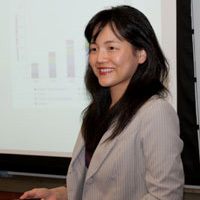 Yumi Shimabukuro's core research and teaching interests lie in the areas of political economy and comparative politics, with a regional expertise in Northeast Asia. She teaches courses that explore the intersection of political, economic, and social development for the Program in Economic Policy Management and the Executive Masters in Public Administration. She previously taught at Harvard University and MIT and was awarded the Derek Bok Certificate of Teaching Excellence. Shimabukuro is completing a book manuscript entitled Building an Inegalitarian Welfare State, which examines the co-evolution of democratic, capitalist, and social welfare institutions in advanced industrialized countries, with a particular focus on Japan. Her article-length papers address the issues of industrial relations, the origins of capitalism and democratic institutions, and the redistributive consequences of varying economic growth strategies. She is currently involved in a project examining the relationship between social investments and income distribution in East Asia and an interdisciplinary collaborative work surveying the extent of social resilience and exclusion in the neoliberal era. Shimabukuro received an MA in International Economics from Columbia University, a Ph.D. in Political Economy from the Department of Political Science at MIT, and a Post-Doctoral Fellowship from Harvard University. She has also served in various capacities in investment banking and the non-profit sector working on issues ranging from financial product innovation to sustainable development practices.